This study surveyed brown trout (Salmo trutta) redd locations and redd construction timing in 2017 in a 4.85 km reach of Crow Creek, a prairie stream encompassed by both privately and publically-owned land adjacent to the Black Hills of South Dakota, USA. The first redd was observed on October 17, with the final redd sighting on November 21. Peak redd construction occurred on November 14, when 13 newly-constructed redds were observed. Only 25 redds were recorded during the eight week survey period. Overall, 84% of redds were observed on private land (5.60 redds/km), while only 16% (3.64 redds/km) were observed on public land. This is the first study to document redd locations and spawning dates for brown trout in a prairie stream in South Dakota. Brown trout (Salmo trutta) are not native to the Black Hills region of western South Dakota (USA), and were initially introduced in the area in 1890 (Barnes, 2007). They now inhabit nearly all of the 1,287 km of streams with suitable habitat (Erickson and Koth, 2000), with populations maintained almost exclusively through natural reproduction and recruitment (James, 2011; Kientz, 2016). Despite this long tenure of natural reproduction, little information on the spatial and temporal characteristics of brown trout spawning in the Black Hills is available. Brown trout typically spawn during a four week period in October and November (Witzel and MacCrimmon, 1983; Wydowksi and Whitney, 2003). Similar to other salmonid species, brown trout reproduce using a collection of gravel pit nests called redds (Helfman et al., 2003). The location of these redds is likely influenced by water depth, water velocity, stream substrates, and stream widths (Knapp and Preisler, 1999) , with preference given to shallow stream reaches of fast-moving water and coarse gravel substrate (Witzel and MacCrimmon, 1983; Grost et al., 1990). Information on the number of redds has been used as an indicator of effective trout population sizes (Meffe, 1986), as well as to monitor fish population dynamics (Konkel and McIntyre, 1987; Pratt, 1992; Weaver, 1992; Rieman and McIntyre, 1996). Ketelsen et al. (2017) provided the first published details on brown trout redd locations in two short reaches of streams within the confines of the Black Hills proper. However, coldwater streams with naturally-reproducing brown trout occur on the prairie adjacent to the Black Hills, and no information on redd distribution and redd construction timing from these areas has been published. Brown trout spawning and redd information is needed to protect spawning areas from potential anthropomorphic degradation. In addition, current spawning data is needed to assess the potential future impacts of climate change (Warren et al. 2012). Thus, the objective of this study was to document the location of redds and the timing of redd construction in a coldwater prairie stream with a long history of successful brown trout reproduction. The study area consisted of 4.85 km of Crow Creek in Lawrence County, South Dakota, USA, beginning at Interstate 90 and extending to the north (Figure 1). This section of Crow Creek is downstream of the confluence of Beaver Creek and Crow Creek, and upstream of the outfall into Redwater River. This low-gradient creek meanders through quaternary alluvium and rests on the Mesozoic Spearfish Formation (Rahn, 2005). Multiple springs add water throughout the study area, including over 10,000 L/min of 11˚C water from the McNenny State Fish Hatchery outfall approximately 0.8 km from the north border. Figure 1: Location of Crow Creek and the section of creek surveyed. The southern 3.75 km of creek is located within private property, where-as the northern 1.10 km creek reach is enclosed within the Mirror Lakes Game Production Area, publicly-accessible land owned by the State of South Dakota. The private land surrounding the creek is a multi-use ranch used primarily for cattle grazing and row-crop agriculture and does not experience angler pressure. The public land surrounding the northern creek section is relatively undisturbed, with minimal grazing. It experiences relatively heavy recreational use, along with some fishing pressure (Simpson et al., 2014). Fish species surveyed by backpack electrofishing in these stream reaches in 2016 include numerous brown trout of all size and age classes, white sucker (Catostomus commersoni), brook stickleback (Culaea inconstans), longnose sucker (Catostomus catostomus), and green sunfish (Lepomis cyanellus) (Rowles and Bucholz 2017). This study began on October 5, 2017, and continued for eight weeks, ending on November 21, 2017. The study area was surveyed weekly by walking the entire reach of the creek and visually noting redd locations. Each weekly survey lasted approximately four hours. A small number of heavilywooded creek reaches were inaccessible and were not surveyed. These reaches were never longer than 20-30 meters and did not appear to have the shallow, fast-flowing water habitats typically needed for brown trout spawning (Shirvell and Dungey, 1983; Louhi et al., 2008). Redd location was recorded using a Trimble (Sunnyvale, California, USA) Global Position System unit. Redds were plotted as a single point, and all redds, even possible repeats, were plotted each week. All points were plotted from the edge of the creek, perpendicular to the stream flow and redd, rather than directly over the location. The geographical data was analyzed using ESRI ArcGIS (Redlands, California, USA). Temperature readings were taken every survey at three separate locations along the study site using a handheld electronic thermometer. These sites were located at the southern boundary of the site (furthest point upstream), the boundary between the public and private land, and the McNenny Hatchery outfall into Crow Creek. Redds were easily observed (Figure 2), but were only noted in creek sections with shallow and fast moving water. The first redd was observed on October 17, while the final redd sighting occurred on November 21. Figures 3a e indicates the location and progression of redd observations. The peak of redd construction occurred on November 14, when 13 newly constructed redds were observed. Overall, 84% of redds were observed on private land (5.60 redds/ km), with 16% observed on public land (3.64 redds/km). There were only three times over the study period that fish were observed building or swimming over a redd, and in all instances the fish were identified as brown trout. Figure 2: Photograph of a typical redd. 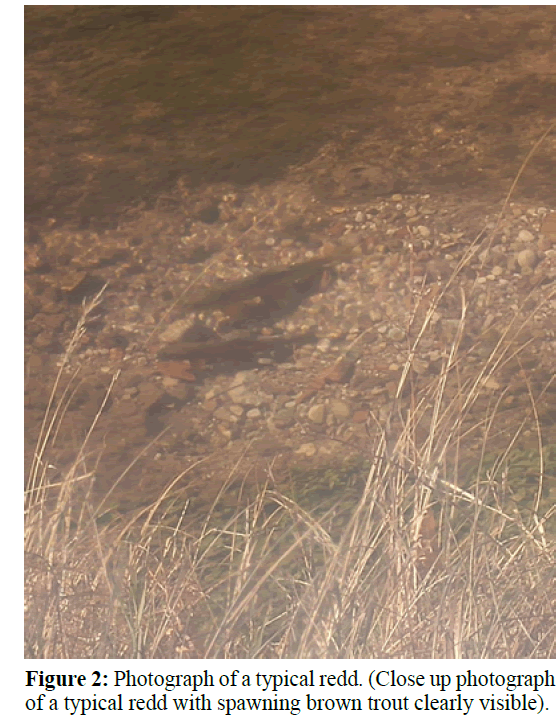 (Close up photograph of a typical redd with spawning brown trout clearly visible). Figure 3(a-e): Redd locations recorded on a weekly basis. There were no significant differences among the three temperature sample locations (Table 1). Within the study period, redd observations were significantly negatively correlated with temperature (r = -0.414; p = 0.044) and date (r = -0.898; p = 0.001). Temperature and date were also significantly correlated with to each other (r = 0.652; p = 0.001). Table 1: Temperatures (˚C) for three locations on Crow Creek encompassing the time frame of brown trout spawning. This is only the second study to document trout redd distribution in a South Dakota stream, and the first to describe the number of redds in a prairie creek. Ketelsen et al. (2017) described redd locations in two streams in the Black Hills, Rapid Creek and Box Elder Creek. While Ketelsen et al. (2017) reported much higher redd numbers and densities (81.5 redds/km) than that observed in this study (3.6 redds/ km), the results cannot be directly compared. In this study, an entire stream reach was surveyed. In the Ketelsen et al. (2017) study, sampling was focused solely on specific spawning areas and non-contiguous stream reaches were sampled. Even though suitable spawning habitat may be widely distributed, salmonid redd locations can be clustered (Dauble and Watson 1990), making redd density comparisons somewhat specious. The peak spawning time of November 4 observed in this study is consistent with the brown trout spawning dates reported in the United States (Witzel and MacCrimmon, 1983; Wydowksi and Whitney, 2003). However it is two weeks later than that reported by Ketelsen et al. (2017) in two mountain streams approximately 80 km south of Crow Creek. Spawning times are generally considered to be consistent from year-to-year (Blanchfield and Ridgway, 1997), but the difference in timing between the South Dakota locations may indicate that spawning times are not as uniform throughout the Black Hills and associated prairie in South Dakota as suggested by Ketelsen et al. (2017). Unlike the mountain streams surveyed by Ketelsen et al. (2017), Crow Creek receives a considerable and consistent inflow of 11°C water from artesian wells and springs. The differing water temperature profiles among the streams may be affecting spawning times (Warren et al., 2012). The differences in water temperature are also likely due to the differences in altitude between the two studies (Livingstone et al. 1999). There is also nearly a 600 m decrease in elevation from the streams surveyed by Ketelsen et al. (2017) compared to Crow Creek. The concentration of redds observed in certain locations on Crow Creek in this study raises the possibility of redd superimposition (Gallagher and Gallagher, 2005). Commonly observed in a number of salmonid species, redd superimposition occurs when redd sites are reused by later spawning fish of either the same or different species (Reiser and Wesche, 1977; Essington et al., 1998). If any such redd imposition did occur, it would not indicate a lack of spawning habitat (Reiser and Wesche, 1977; Gallagher and Gallagher, 2005). Although the weekly sampling used was within the schedule recommended by Gallagher et al. (2007), there are limitations with this study. Redds may have been missed due to the relative inexperience of the individual conducting the survey (Mulfed et al., 2006), although this is mitigated by the small size of Crow Creek and training of the observer. High sediment loads due to the presence of cattle on the private land section and bridge construction on the public land section may have impacted brown trout spawning attempts (Wohl and Carline, 1996). High levels of suspended solids also may have reduced visibility of the redd observer, potentially leading to the exclusion of redd sites. Despite the afore-mentioned limitations the redd counts in this study are likely an accurate reflection of brown trout spawning in Crow Creek. Although not indicative of successful reproduction and recruitment, redd counts have been used in other locations to monitor the status of salmonid populations (Beard and Carline, 1991; Emlen, 1995; Maxwell, 1999). Using redd counts to survey brown trout populations in Crow Creek would be much less expensive and less laborious than the backpack electrofishing surveys currently conducted (Rowles and Bucholz, 2017). This is the first documentation of brown trout redd construction timing and numbers in a South Dakota prairie trout stream. Brown trout spawning in Crow Creek appears to be slightly later than in South Dakota mountain stream reaches, and may also be less concentrated. This baseline information will be useful for monitoring future reproductive efforts of brown trout in Crow Creek, especially in light of ongoing and likely increased anthropomorphic effects, and climate change. We thank Chris and Diane Miller, Abigail Domagalll, Nathan Winter, Tim Palmer, Eric Krebs, Nathan Huysman, and Jill Voorhees for their assistance with this study. Barnes, M.E., 2007. Fish Hatcheries and Stocking Practices: Past and Present. In: History of fisheries and fishing in South Dakota. (Ed. C. Berry, K. Higgins, D. Willis and S. Chipps), South Dakota Department of Game, Fish and Parks, Pierre, South Dakota 267-294. Beard Jr, T.D. and Carline, R.F., 1991. Influence of spawning and other stream habitat features on spatial variability of wild brown trout. Trans. Am. Fish. Soc. 120: 711-722. Blanchfield, P.J. and Ridgway, M.S., 1997. Reproductive Timing and Use of Redd Sites by Lake Spawning Brook Trout (Salvelinus fontinalis). Can. J. Fish. Aquat. Sci. 54: 747-756. Dauble, D.D. and D.G. Watson., 1990. Spawning and abundance of fall chinook salmon (Oncorhynchus tshawytscha) in the Hanford Reach of the Columbia River 1948-1988. PNL 7289. Pacific Northwest Laboratory, Richland, Washington. Dauble, D.D., D.G. Emlen, J.M., 1995. Population variability of the Snake River Chinook salmon (Oncorhynchus tshawytscha). Can. J. Fish. Aquat. Sci. 52: 1442-1448. Erickson, J.W. and Koth, R., 2000. Black Hills of South Dakota fishing guide. South Dakota Department of Game, Fish and Parks, Pierre, South Dakota. Essington, T.E., Sorensen, P.W., Paron, P.G., 1998. High rate of redd superimposition by brook trout (Salvelinus fontinalis) and brown trout (Salmotrutta) in a Minnesota stream cannot be explained by habitat availability alone. Can. J. Fish. Aquat. Sci. 55: 2310-2316. Gallagher, S.P. and Gallagher, C.M., 2005. Discrimination of Chinook Salmon, Coho Salmon, and Steelhead Redds and Evaluation of the use of Redd Data for Estimating Escapement in Several Unregulated Streams in Northern California. N. Am. J. Fish. Manage. 25: 284-300. Gallagher, S. P., Hahn, P.K.J. and Johnson, D.H., 2007. Redd counts. In: Salmonid field protocols handbook: techniques for assessing status and trends in salmon and trout populations. (Ed. D. H. Johnson). A. Fish. Society, Bethesda, Maryland. 197‑234. Grost, R.T., Hubert, W.A., Wesche, T.A., 1990. Redd site selection by brown trout in Douglas Creek, Wyoming. J. Freshwater Ecol. 5: 365-371. Helfman, G.S., Collette, B.B., Facey, D.E., 2003. The Diversity of Fishes. Blackwell Science, Malden, Massachusetts. James, D.A., 2011. Spawning-related movement patterns of a unique rainbow trout (Oncorhynchus mykiss) population in a South Dakota headwater stream. J. Freshwater Ecol. 26: 43-50. Ketelsen, B., Simpson, G., Barnes, M.E., 2017. Trout redd locations in two streams in the Black Hills, South Dakota, USA. Nat. Resour. 8: 94-102. Kientz, J.L., 2016. Survival, abundance, and relative predation of wild rainbow trout in the Deerfield Reservoir system, South Dakota. M.S. Thesis. South Dakota State University, Brookings, South Dakota. Knapp, R.A. and Preisler, H.K., 1999. Is it possible to predict habitat use by spawning salmonids? A test using California golden trout (Oncorhynchus mykiss aguabonita). Can. J. Fish. Aquat. Sci. 56: 1576-1584. Konkel, G.W. and McIntyre, J.D., 1987. Trends in spawning populations of Pacific anadramous salmonids. U.S. Fish and Wildlife Service Technical Report 9. Livingstone, D.M., Lotter, A.F., Walkery, I.R., 1999. The decrease in summer surface water temperature with altitude in Swiss alpine lakes: a comparison with air temperature lapse rates., Arctic, Antarctic, Alpine Res. 31: 341-352. Louhi, P., Mäki‐Petäys, A., Erkinaro, J., 2008. Spawning habitat of Atlantic salmon and brown trout: general criteria and intragravel factors. River Res.Appl. 24: 330-339. Maxell, B.A., 1999. A prospective power analysis on the monitoring of bull trout stocks using redd counts. N. Am. J. Fish. Manage. 19: 860-866. Meffe, G.K., 1986. Conservation genetics and the management of endangered fishes. Fisheries 11: 14-23. Muhlfed, C.C., Taper, M.L., Staples, D.F., Shepard, B.B., 2006. Observer error structure in bull trout redd counts in Montana streams: implications for inference on true redd numbers. Trans. Am. Fish. Soc. 135: 643-654. Pratt, K.L., 1992. A review of bull trout life history. In: Proceedings of the Gearhart Mountain bull trout workshop. (Ed. P.J. Howell and D. V. Buchanan), American Fisheries Society, Oregon Chapter, Corvallis, Oregon. 5-9. Rahn, P.H., 2005. Chemical weathering and land denudation of Paleozoic carbonate rocks in the Black Hills, South Dakota and Wyoming. Proc. S. D. Acad. Sci. 84: 55-69. Rieman, B.E. and McIntyre, J.D., 1996. Spatial and Temporal Variability in Bull Trout Redd Counts. N. Am. J. Fish. Manage. 16: 132-141. Reiser, D.W. and Wesche, T.A., 1977. Determination of Physical and Hydraulic Preferences of Brown and Brook Trout in the Selection of Spawning Locations. Water Resources Series No. 64, Water Resources Research Institute, University of Wyoming, Laramie, Wyoming. Rowles, G. and Bucholz, M., 2017. Statewide Fisheries Surveys, 2016, Survey of Public Waters, Part 1- Streams, Region 1. Completion Report. South Dakota Department of Game, Fish and Parks, Pierre, South Dakota. Shirvell, C.S. and Dungey, R.G., 1983. Microhabitats chosen by brown trout for feeding and spawning in rivers. Trans. Am. Fish. Soc. 113: 355-367. Simpson, G., Barnes, M.E., Parker, T.M., Voorhees, J., 2014. Non-consumptive activities on a public hunting and fishing area. Nat. Resour. 5: 876-883. Warren, D.R., Robinson, J.M., Josephson, D.C., Sheldon, D.R., Kraft, C.E., 2012. Elevated Summer Temperatures Delay Spawning and Reduce Redd Construction for Resident Brook Trout (Salvelinus fontinalis). Glob. Change Biol. 18: 1804-1811. Weaver, T.M., 1992. Coal Creek fisheries monitoring study number X and forest-wide fisheries monitoring-1990. Montana Department of Fish, Wildlife and Parks, Special Projects, Kalispell, Montana. Witzel, L. D. and MacCrimmon, H.R., 1983. Redd-Site Selection by Brook Trout and Brown Trout in Southwestern Ontario Streams. Trans. Am. Fish. Soc. 112: 760-771. Wohl, N.E. and Carline, R.F., 1996. Relations among riparian grazing, sediment loads, macroinvertebrates, and fishes in three central Pennsylvania streams. Can. J. Fish. Aquat. Sci. 53: 260-266. Wydowksi, R.S. and Whitney, R.R., 2003. Inland Fishes of Washington, 2nd edition. University of Washington Press, Seattle, Washington.